Buckeye Valley’s Evan Ulrich tags out Marion Harding’s Zach Wilson (12) during Wednesday’s MOAC showdown in Delaware. Senior Zach Schneider proved why confidence is an important trait. 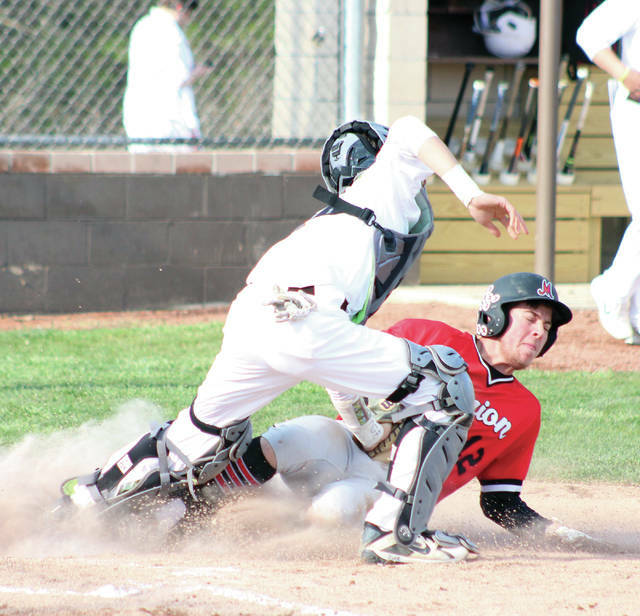 He stepped to the plate with two outs in the seventh and lined a walk-off single to center to cap a 4-run comeback by the Buckeye Valley baseball team in a 5-4 win over Marion Harding Wednesday night in Delaware. Landon Alexander and Evan Ulrich each singled, sandwiched around a Travis Pennington walk to load the bases, to start the seventh. Kyler Lewis grounded into a 6-4-3 double play to score the tying run and set up Schneider’s game-winner. Harding built a 4-0 lead on a Kirkland Hawkins RBI single in the first, a two-run single by Bob Vitek in the third and a Gabe Detwiler RBI single in the fourth. Meanwhile, Harding pitcher Joe Hamon held the Barons to a Schneider walk and an Andy Eurez single through four innings. The Baron offense was late arriving – as has been the case for much of their current five-game winning streak. They scored five sixth-inning runs in Tuesday’s win in Marion to blow open a 12-5 victory. They scored all five of their runs after the fourth inning in Saturday’s 5-2 win over Whetstone in the second game of a doubleheader after scoring nine runs in the ninth inning to beat host London 14-5 in the opener. This time around, the offense got going on a pair of walks by Grant Owens and Andy Anthony to start the rally in the fifth. The two scored on an error to get BV on the board and Ulrich added a RBI single to cut the deficit to one. Schneider had a chance to play hero but was robbed by Detwiler on a diving catch of a ball to short center to end the rally after an error put runners on second and third. Hamon went five innings and allowed three unearned runs on two hits and three walks with a pair of strikeouts, but didn’t factor in the decision. Owens went the front six on the mound for the Barons (10-5, 4-3), keeping them in the game. He allowed four runs (three earned) on 10 hits and four walks with five strikeouts, including the last two to end the sixth with a runner in scoring position. Zach Mitchell struck out the side in order in the seventh to pick up the win. Sam Mitchell was saddled with the loss, tossing 1.2 innings of relief for the Presidents (4-8, 1-6). He allowed two runs (both earned) on four hits and a walk and struck out one. Vitek had two hits and drove in two, Detweiler had two hits, a RBI and scored twice and Noah Thompson had three hits and a run to lead the Harding offense. BV continues league play Today at Galion beginning at 5:15 p.m.